The main U.S. stock market indexes were mixed between -0.2% and +0.2% on Wednesday, as investors took short-term profits off the table following recent rally. The S&P 500 index remains above the level of 2,700 and it currently trades 5.7% below its January 26 record high of 2,872.87. The Dow Jones Industrial Average lost 0.2% and the technology Nasdaq Composite gained 0.2%, as it was relatively slightly stronger than the broad stock market yesterday. The nearest important level of resistance of the S&P 500 index is at around 2,715-2,720, marked by yesterday’s daily high. The next resistance level is at around 2,740, marked by some March local highs and March 19 daily gap down of 2,741.38-2,749.97. The resistance level is also at 2,760-2,765. On the other hand, the nearest important support level is now at 2,700, marked by previous resistance level. The support level is also at 2,685-2,695, marked by Tuesday’s daily gap up of 2,686.49-2,692.05. Downward Reversal or Just Profit Taking Action? Expectations before the opening of today’s trading session are slightly negative, because the index futures contracts trade 0.2% below their yesterday’s closing prices. The European stock market indexes have been mixed so far. Investors may continue taking profits off the table following Tuesday’s rally. 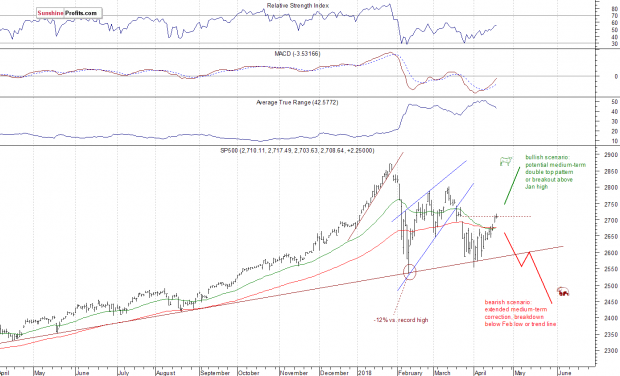 Is short-term uptrend over? Probably not, but we will see if the index remains above previous resistance level of 2,695-2,700 or gets back lower again. Investors will wait for some economic data announcements today: Initial Claims, Philadelphia Fed Manufacturing Index at 8:30 a.m., Leading Indicators at 10:00 a.m. Investors will also wait for more quarterly earnings releases.